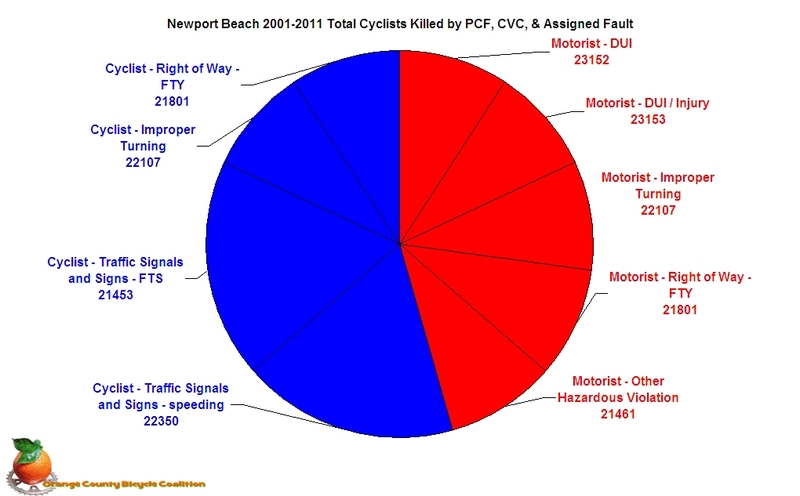 Continuing our presentation of bike rider safety, we present the latest statistics for Newport Beach. We combined the previous charts from other cities, but here we separate injuries from deaths in two charts. The 1st quarter of 2011 data is almost complete, and the rest of the year continues to be updated. 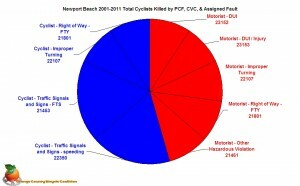 2012 data is slowly being processed from other counties, but the latest we have for Newport is from August 2011. The NPB PD has not been responsive to our repeated requests for current information, so we’ll show what we have now, and maybe in a year or two the charts will reflect what they input to the system yesterday. The chart represents the 11 fatalities that occurred in this city up to August of 2011. The color indicates who was at fault for the collision as determined by the appropriate authorities. 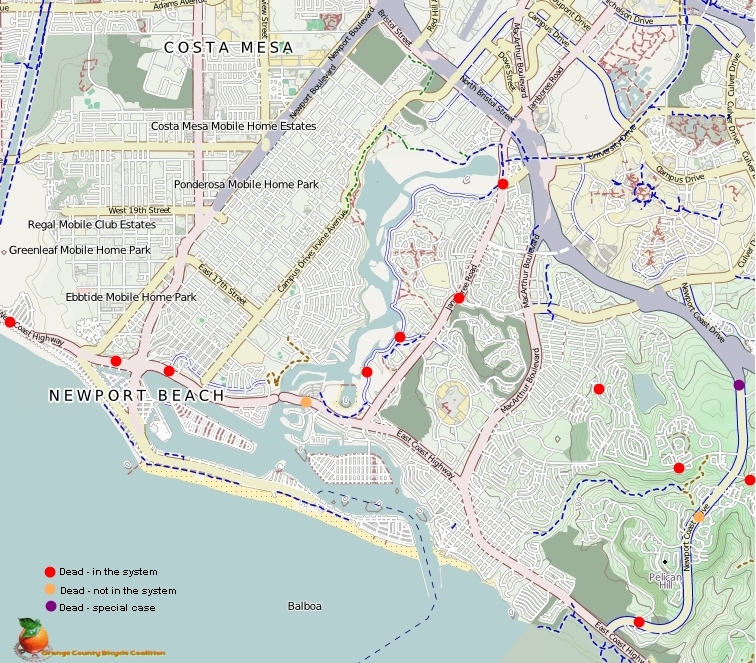 Newport Beach enjoys the dubious distinction of earning a “Bronze” in the deadliest city category of county competition with Anaheim and Santa Ana earning “Silver” and “Gold” respectively. Cyclists ignored traffic signals and signs to their demise by failing to stop or exceeding the speed limit and loosing control. 40% of drivers’ fault for killing someone on a bicycle was do to being under the influence, and that’s for those who were caught. 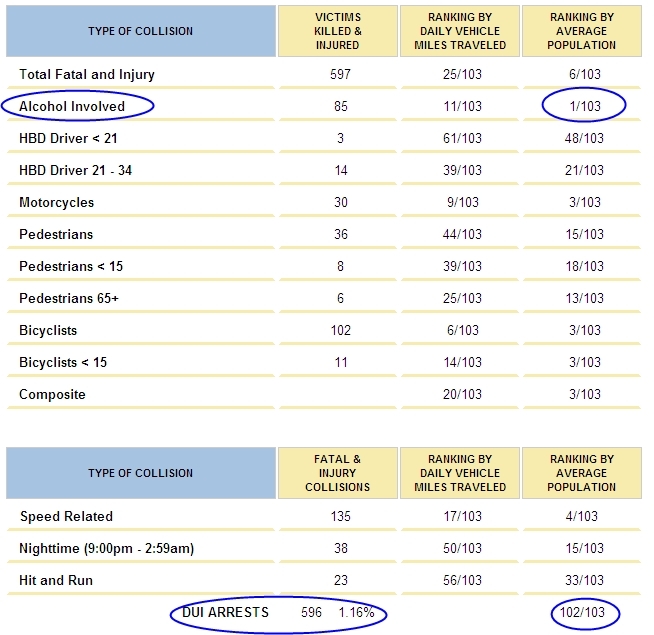 From the California Office of Traffic Safety, the above chart is for their “latest” data from 2010. Despite the abysmal safety record for anything not on four wheels, Newport Beach earned the “gold medal” by placing 1st from 103 cities of similar size for alcohol involvement in collisions in the city. The good news for those that like to drive under the influence is that Newport Beach ranked next to last in enforcement as can be seen in their arrest percentage and ranking. True, this data is from 2010 and things may have changed for the better, which is why we asked in the first place. 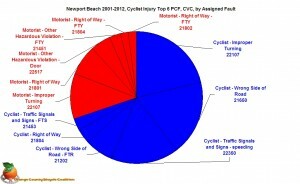 This chart reflects the cyclist injuries within the city. 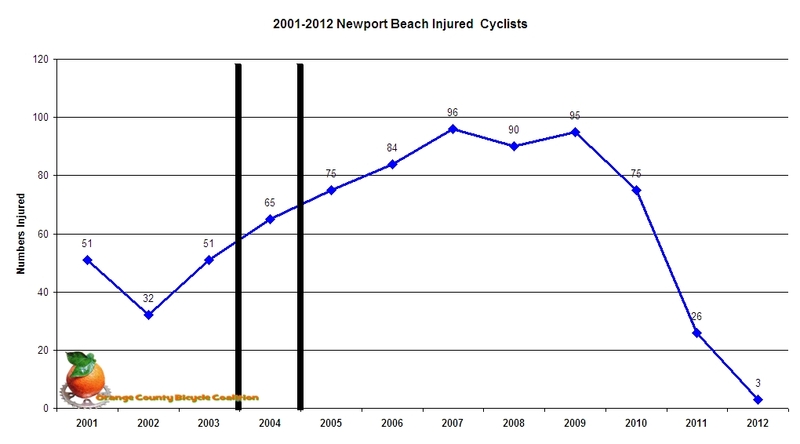 Newport rides mid-pack at 5th in the top 10 cities injurious to your riding pleasure. Clearly cyclists are at fault for the majority of collisions in Newport by riding on the wrong side of the road, not far enough to the right, failing to yield or stop, and failing to, CVC22109: “stop or suddenly decrease the speed of a vehicle on a highway without first giving an appropriate signal”. Bicycles can be stopped faster than a motor vehicle, which makes us wonder; were the drivers following too close? Typically the presumption of fault is on the rear-most motorist in a chain reaction collision. So 101 bike riders stopped as conditions warranted (stop signs, lights, being cut-off, etc. ), yet were found “at fault” for failing to give an appropriate slowing or stopping signal? By now you probably want to know where all the action took place. The red dots are in the CHP system, while the orange are not. The size of the dots have nothing to do with the counts of injury at a particular location. Of interest in this map is the dilemma faced by residents or tourists of the peninsula. Hard to get into, out of, and round about on two wheels it seems. 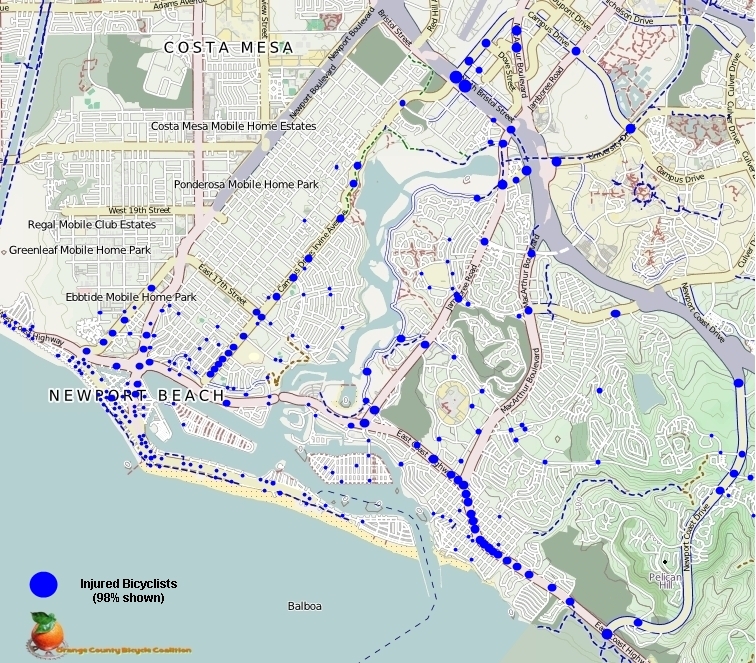 Also interesting is the high count of collisions on Irvine /Campus close to Harbor High and UCI, while no surprise at the “gauntlet” that is Corona del Mar. 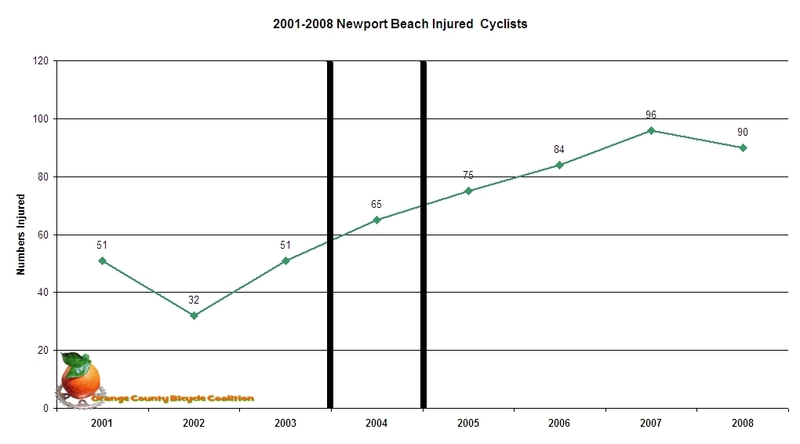 This chart shows the number of bike riders injured in collisions in Newport Beach from 2001-2008. This time- frame is chosen to reflect 4 years on either side of the control or “improvement” of PCH. While things may have improved for the businesses of Corona del Mar, it appears people on two wheels paid the price. Since we cannot go back we must go forward. The next chart shows a dramatic drop from ’09-10, which the tourism board probably found encouraging. Another drop in ’11 gives the impression that all is well until the realization hits that there’s still another 2 quarters to feed into the chart! Even so, doubling the currently recorded 26 injuries to 52 would put the city on track to have the lowest injury rate since 2003! Is there data manipulation going on behind the scenes? There’s no way to know, and people seemed conditioned to accept a 2 year time delay in actionable, potentially lifesaving information. Consider: a policeman fills out a collision report on his handheld wireless gps gizmo, and beams the collision record back to the department complete with pictures. The collision summaries are batched to the state. Minutes later, a collision request occurs at the local station. The request is honored within seconds, yet to receive a response from the state will take 2 years? If someone can explain how this makes sense, saves lives, time, and money we’d love to hear it. Consumer Contact: For additional information, contact Specialized toll-free at (877) 808-8154 from 8 a.m. to 5 p.m. PT Monday through Friday, or visit the company’s website and click on Support/Safety Notices. See pictures of all the affected models at the CPSC recall announcement page here. This morning we received confirmation of an earlier bicycle collision on the other side of the bridge at Dover and PCH on Thursday the 13th of 2012. We would like to update the above with the rider’s condition, and ask for your healing thoughts towards “Rider A“. Rider A, is a seasoned triathlete, riding a “course” she’s ridden many times before in her training rides. Surgery to relieve pressure in the skull scheduled for today was deemed unnecessary by the medical staff, although until bleeding is absorbed,they won’t know anything about the use of her right leg or recovery amount, and recovery time is unknown at this point. Rider A was transported to another hospital out of the area, and remains in ICU. We send her our best recovery wishes and hope you do too.